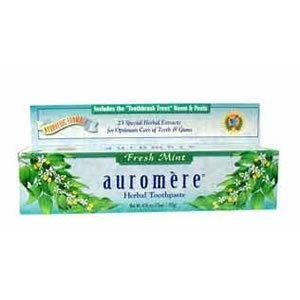 According to Ayurvedic science, the 26 botanical extracts and essential oils in Auromere Toothpaste are prized for their astringent, antiseptic, purifying and analgesic properties which help prevent plaque and tartar formation, ward off cavities, sooth gum inflammation, freshen breath and leave teeth feeling squeaky clean. 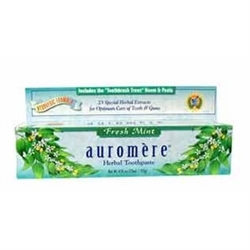 Especially recommended for sensitive teeth and gums, Auromere toothpaste can be massaged into gums for added benefit. Free of fluoride, gluten, bleaches, artificial sweeteners, dyes, bleaches,animal ingredients and artificial preservatives. I love this toothpaste. I have always used toothpastes such as Colgate or Crest. This toothpaste makes my mouth feel very fresh and the flavor is great.